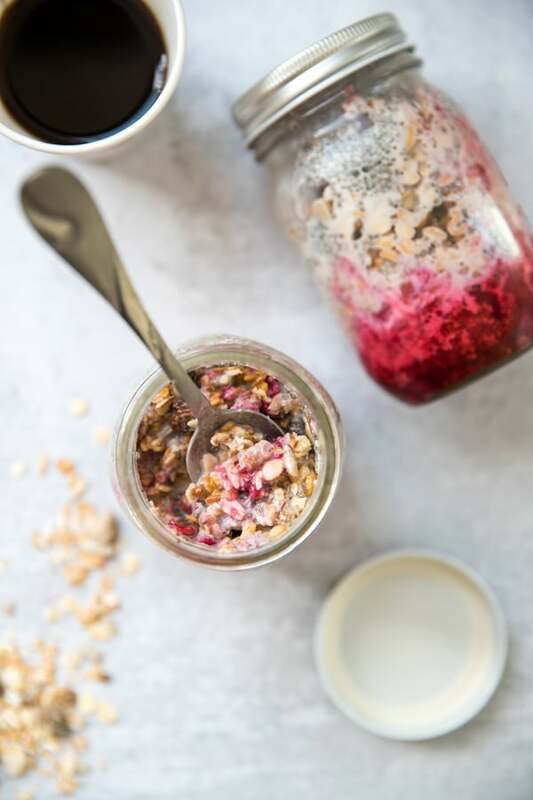 Overnight Breakfast Raspberry Muesli is the perfect make-ahead breakfast for those of us on the go! 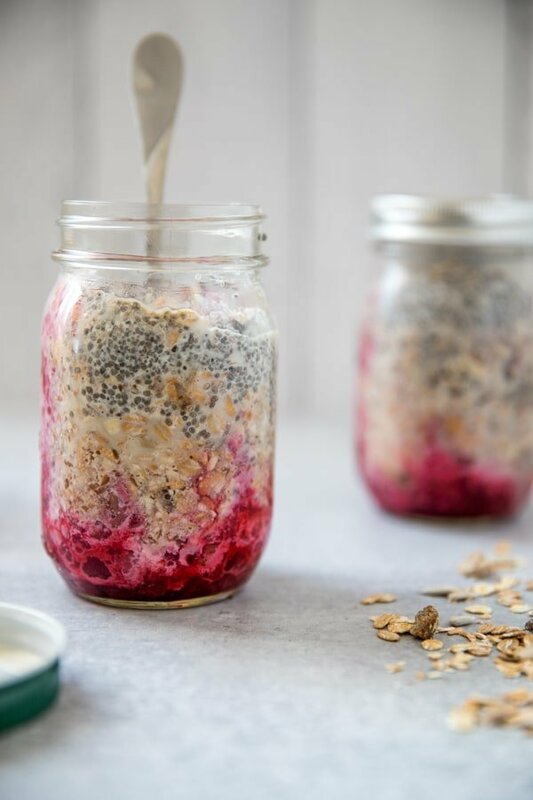 Haven’t had muesli yet? Muesli is an uber-nutritious mix of rolled oats, nuts, seeds, and fruit. It is a healthy whole grain addition to this recipe and it far surpasses oatmeal in flavor and texture—and it’s far easier to make using the overnight method. Today, muesli remains one of the world’s most popular cereals. It can be eaten cold or hot, in a bowl or from the bag. It can be served up creamy or just as it is and can be integrated into your favorite baked goods or your healthy snacking routine. It’s good to use in both sweet and savory dishes, from chocolate chip cookies and blondies to rosemary granola and savory oatmeal. Or – in this delicious breakfast! 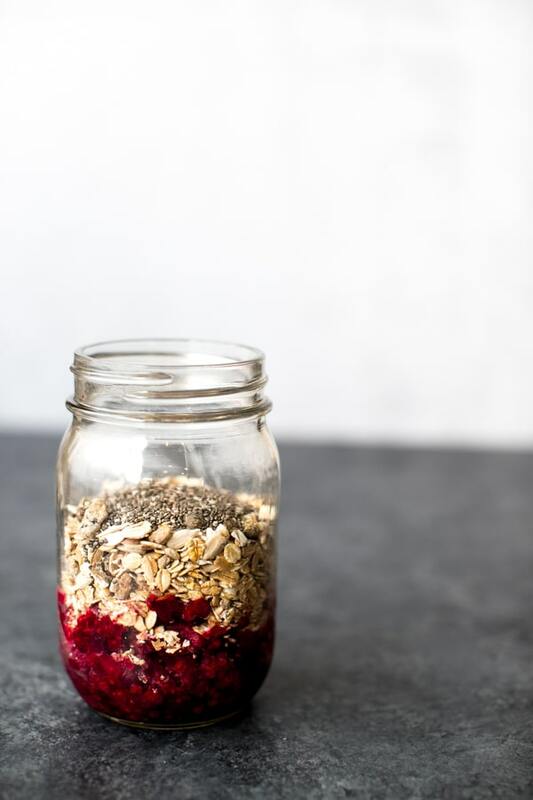 Muesli is chewy, crunchy, luxurious, and slightly sweet, muesli is more than worthy of a spot in your morning mason jar. It consists of a delicious mix of whole grain oats, wheat, sunflower seeds, raisins, dates, almonds, walnuts and flaxseeds. One serving packs 4g of fiber and protein, plus 6% of your daily iron needs. When softened, this muesli packs a nutty, comforting, and mildly sweet flavor. You also still get plenty of crunch, thanks to sunflower kernels and flaxseeds. What type of fruit should I use for this overnight muesli? I recommend frozen fruit for this recipe since the fruit is on the bottom. The frozen fruit holds up nicely and adds great flavor, without compromising any of the nutrition, to this breakfast! Use frozen raspberries, frozen strawberries, or a frozen berry blend if you’d like! 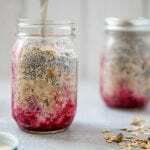 The great thing about these muesli jars is how customizable they are! Second, drizzle the honey/maple syrup. Then drizzle the honey/maple syrup. 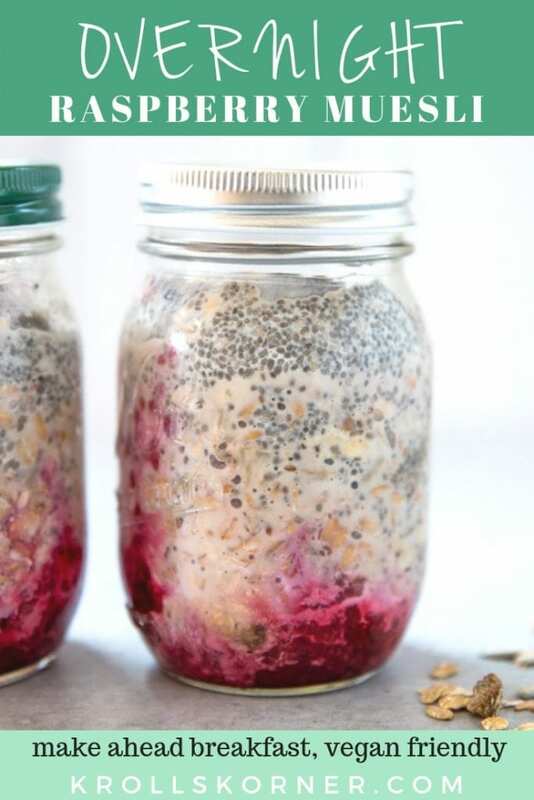 Next, pour on the chia seeds! Lastly pour the milk on top! If you’re loving this breakfast idea I am sure you’ll also love these Pumpkin Overnight Oats and this Simple Berry Oatmeal Bake too! Both great breakfasts for busy mornings. 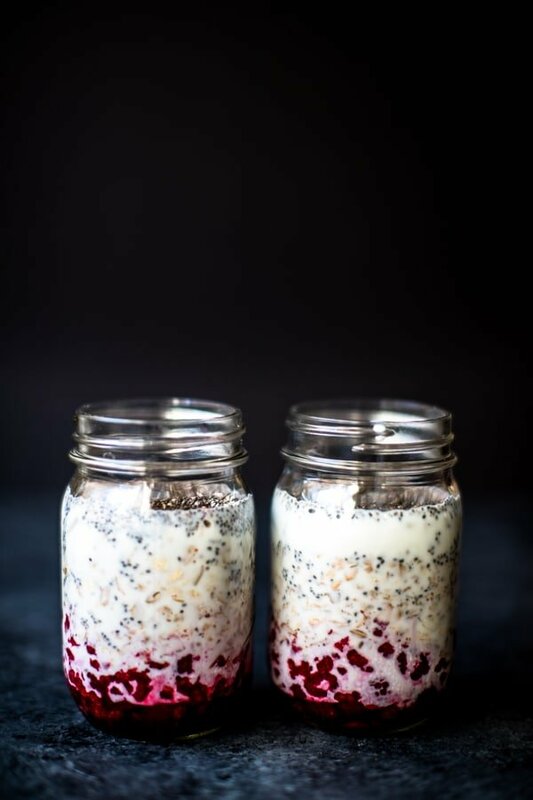 Making your breakfast the night before has never been easier (or more nutritious) than with these fruit on the bottom overnight muesli breakfast jars! Place thawed frozen raspberries in the bottom of a jar and mash gently with a fork. The add the remaining ingredients in this order: honey, muesli, chia seeds, and milk. No need to even stir, just put the lid on and place in the fridge for at least 3 hours or overnight! 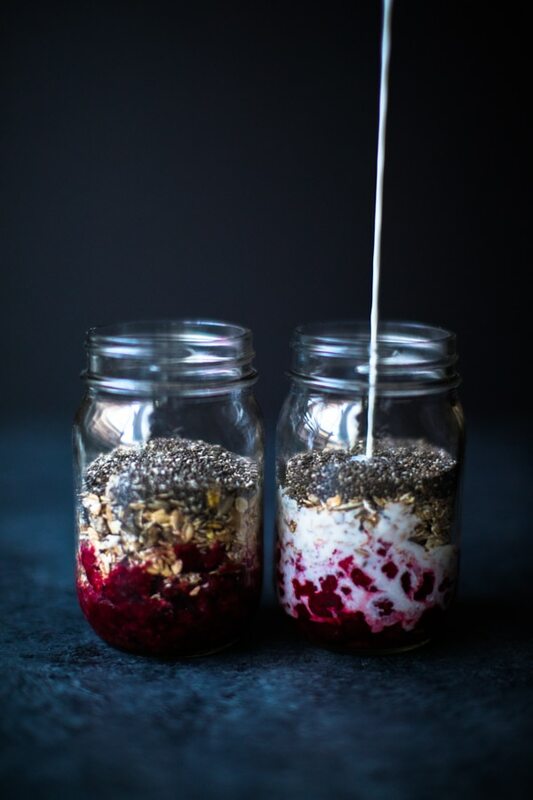 Love this overnight muesli recipe? Pin it for later!